Hemmings Motor News published an extended discussion on the Cadillac Cimarron in their always interesting Hemmings Daily blog, so I figured I’d bring one of my first posts up to a more current location. Ah—the poor Cadillac Cimarron, rushed to market for CAFE and other reasons without much thought as to who would actually buy it. When released in 1982, it was just a nice as possible, relatively well equipped Chevrolet Cavalier. Inside page from the 1982 Cadillac Cimarron brochure, linked from the Old Car Manual Project’s amazing brochures section. The only engine available for 1982 was the 88 bhp L46 1.8 liter/112 ci inline four with Rochester Varajet II two-barrel carburetor. When paired with the standard four-speed manual transmission, mileage was an impressive 26 city/42 highway by the standards of the day (about 21/31 by modern standards), but the car was slow—0-60 mph took a little under 14 seconds. A three-speed automatic transmission was optional and likely even slower (estimates come to about 16 seconds). The 13.7-gallon fuel tank gave a range of between 330 and 420 miles with a 10% reserve. The $12,181 base price (about $32,900 in today’s dollars—just a little under what a base 2018 Cadillac ATS sedan costs) included standard exterior and mechanical features such as power brakes, power steering, power mirrors, intermittent windshield wipers, and P195/70R13 tires on 13-inch aluminum wheels. Air conditioning, leather seating areas, a leather steering wheel, a tachometer, and an AM/FM stereo radio with four speakers were all standard in the interior. Options included a sunroof ($261), cruise control (about $150), power door locks ($12—why bother making it an option? ), power windows (yes, the base 1982 Cimarron came with roll-up windows—power windows were an extra $216), six-way power seats ($366), tilt steering wheel ($88), and an AM/FM stereo radio with cassette ($153). It wasn’t hard to load a Cimarron up to almost $13,500—real money in 1982 and about $36,400 in 2018 dollars. In typical General Motors fashion, the Cimarron improved each year (sometimes significantly). However, the stench of that horribly failed initial release stayed with the car until Cadillac finally stopped selling them at the end of the 1988 model year. By that point, the Cimarron had upgraded from the fairly awful four-cylinder to a decent (and standard) V6 and had exterior styling that was at least somewhat more differentiated from Chevrolet’s. So, the Cimarron remains a spectacularly easy target—routinely making those “worst ten cars of all time” lists and suchlike. I have yet to see a Cimarron at a serious classic car show, but I’m betting some intrepid soul will save one and bring it back. Surprisingly, Hagerty does track the Cimarron with their valuation tools—according to them, all the money for a 1982 in #1/Concours condition is $6,100, with a far more typical #3/Good car going for $1,600. I can’t remember ever seeing one for sale in the Hemmings Motor News classifieds—they’re treated by Cadillac folks like Ford folks treat the Mustang II from the 1970s. You do occasionally see them on eBay Motors. This afternoon I was walking in the University City portion of Philadelphia and I saw a later Cadillac Cimarron driving towards me in surprisingly good shape. As good a reason as any to finally complete this blog entry. It is an article of faith in the automotive world that General Motors often finally gets a car right just before killing it. Examples that spring to mind are the last of the Pontiac Fieros and the last of the Cadillac Allantes. However, in the case of the Cadillac Cimarron, all GM was able to do was make it less awful and embarrassing. The only engine available for 1988 was the 125 bhp LB6 2.8 liter V6 with multi-port fuel injection. When paired with the standard five-speed manual transmission, mileage was 20 city/29 highway by the standards of the day (18/27 by today’s standards). A three-speed automatic transmission was optional and rated at 20 city/27 highway. 0-60 in the 2,800-pound car came in about 9.5 seconds with the manual transmission and about 10.5 seconds with the automatic transmission. The $16,071 base price (about $33,500 in today’s dollars) included standard exterior and mechanical features such as power brakes, power steering, power mirrors, intermittent windshield wipers, and 13-inch aluminum wheels. Air conditioning, leather seating areas, a leather steering wheel, a tachometer, and an AM/FM stereo radio with four speakers were all standard in the interior. Options included a sunroof, cruise control, power door locks, power windows, six-way power seat, tilt steering wheel, and the Delco-GM Bose Symphony Sound System. Exterior styling that was at least somewhat more differentiated from the Chevrolet Cavalier sedan than the earliest Cimmarons had been. A more aggressive and distinctive grille had been added in 1984, the front end had been lengthened in 1985, and ribbed lower body cladding had appeared in 1986. 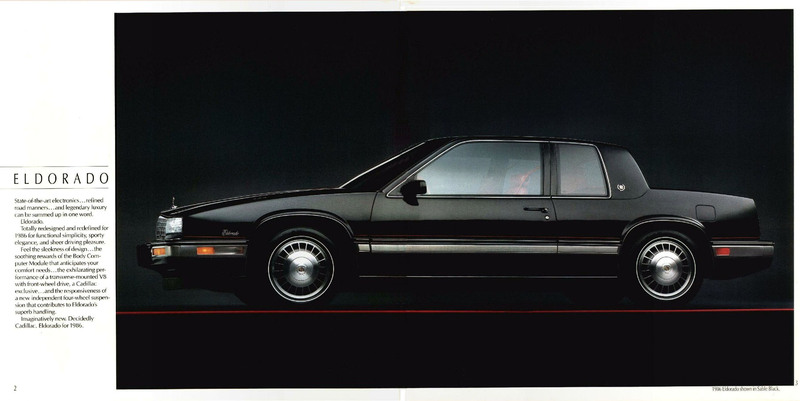 Page from the 1988 Cadillac brochure, linked from the Old Car Manual Project’s amazing brochure’s section. By 1988, sales of the Cimarron had completely collapsed. After a first year peak of almost 26,000 unit sold in the 1982 model year, sales dropped to a sad 6,454 in the Cimarron’s final model year. I have yet to see a Cimarron at a serious antique car show—they’re treated by Cadillac folks like Ford folks treat the Mustang II from the 1970s—but I’m betting some intrepid soul will save one and bring it back for judging. You occasionally see them for sale in the Hemming’s Motor News classifieds and on eBay Motors: as I write this in June 2015, there’s a Glacier Blue 1987 Cimarron with a Dark Blue leather interior and 11,300 miles listed on Hemmings for $14,900. Is it possible to miss the market more than this? For, 1986 Cadillac downsized the front wheel drive Eldorado coupe again. This time, wheelbase dropped to 108 inches, and overall length was down by over 16 inches to 188 inches—what was supposed the top of the non-limousine Cadillac line was now about the size of a 1986 Chevrolet Celebrity (or only about six inches longer than a 2014 ATS) and a full three feet shorter than the (admittedly massive) 1978 Eldorado. Predictably, Eldorado buyers didn’t go for it. Sales collapsed from about 74,000 in 1985 to about 21,000 in 1986—definitely not what would be expected from a complete model revision. So, what did those relatively few buyers get with their $24,251 (about $52,600 in today’s dollars) 1986 Eldorado? Standard exterior and mechanical equipment included power four-wheel disc brakes, power steering, and aluminum alloy wheels. Inside, front bucket seats, power mirrors, power windows, power door locks, a power trunk release, cruise control, electronic climate control, and an AM/FM stereo radio with power antenna were all included, so the Eldorado was at least pretty well equipped. Moving up to the Biarritz (almost always the top if the line Eldorado since 1956) cost either $3,095 (with cloth seats) or $3,495 (with leather seats) raising the price to either $27,346 ($59,400 today) or $27,746 ($60,200 today). Standard equipment on the Biarritz included nicer seats with power lumbar support, two-tone paint, and real walnut accents. Options included a power Astroroof ($1,255), a nicely integrated cellular phone ($2,850), the FE2 touring suspension with 15-inch aluminum alloy wheels and 215/60R15 Goodyear Eagle GT tires ($155), and the Delco-GM/Bose Symphony Sound System ($895). 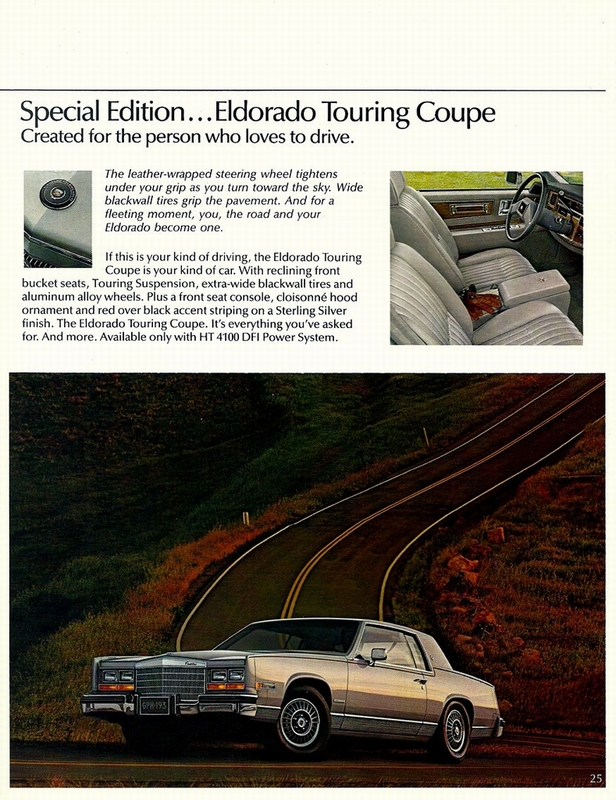 The Eldorado’s engine was Cadillac’s 130 bhp HT-4100 throttle body fuel injected 4.1 liter/249 ci V8 paired with a four-speed automatic transmission. Fuel economy was 17 city/26 highway by the standards of the day (15/24 by today’s standards). Since the engine and transmission remained the same and the Eldorado was smaller and lighter, performance was better but still not very impressive: 0-60 improved to about 11 seconds. Page from the 1986 Cadillac Eldorado brochure, linked from the Old Car Manual Project’s amazing brochures section. According to Hagerty’s valuation tools, all the money for a 1986 Eldorado in #1/Concours condition is $10,400, with a far more typical #3/Good car going for a mere $3,900. Eldorados of this age come up for sale often in Hemmings Motor News, so folks are saving them. As I write this in June 2014, four 1986 Eldorados are for sale, with prices ranging from $7,750 to $11,995.